Bangladesh finally showed substance as a competitive one-day outfit in the calendar year 2012 with as many as five wins in nine games against top opposition, and came only within two runs of wining their maiden Asia Cup title in front of their own fans. True, all the matches were played at home, but surely Bangladesh are coming of age as a solid one-day nation even as their Test struggles continue. In this post, let us go down the years to recollect the Tigers’ first ODI victory. Bangladesh played their first ODI back in the 1985-86 Asia Cup against Pakistan at Moratuwa. Led by Gazi Ashraf, the new kids on the block were rolled over for just 94 and lost by seven wickets. Thus began a long ordeal for them in international cricket and they suffered a run of a record 22 defeats in a row, until one day in Hyderabad (Bangladesh themselves broke the record with another wretched run between 1999 and 2002, losing 23 games on the trot until a washout stemmed the rot). This match was part of one of the many tri-series that took place in the late nineties. This one, played in May 1998, was hosted by India, who invited the two best Associate members of that time – Bangladesh and Kenya – for the series. Bangladesh began the tournament on an expected note, losing to India by five wickets. Their next game was a day-nighter on 17th May, 1998 at the Lal Bahadur Shastri Stadium in Hyderabad against Kenya, who had beaten Bangladesh twice just six months back. Kenyan captain Asif Karim elected to bat after winning the toss, and his team were soon 29/2. Bangladesh bowled with discipline and kept Kenya to 89/4 after 20 overs. Hitesh Modi (40) and debutant Ravindu Shah (52) revived the innings with a 67-run stand for the fifth wicket, but could not help their team gain control. Kenya were finally dismissed for 236 in 49 overs, losing their last five wickets for 43 runs. 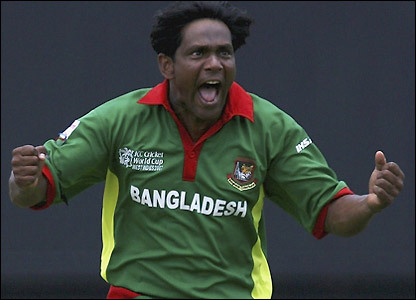 Bangladesh’s talented all-rounder Mohammed Rafique took 3/56 with his left-arm spin. The total was by no means a daunting one to chase, but Bangladesh still needed a solid start, given their brittle batting line-up. The openers Rafique and Athar Ali Khan delivered it, putting on 137 in 26 overs. Rafique added to his good bowling show with a stroke-filled 77 off 88 balls, making Kenya pay for two dropped chances when he was on 14. Athar was more subdued, making 47 in 91 balls. With 17-year-old left-arm spinner Mohammed Sheikh (2/46) bowling well, Kenya had a chance of a fightback when the score read 166/3. But those hopes were dashed by a 62-run stand for the fourtth wicket between Aminul Islam and captain Akram Khan. When Akram was out for 39, the Tigers needed just ten runs in three overs, which were duly achieved in the next over itself. Bangladesh reached 237/4 in 48 overs and the six-wicket win was their first ever in ODI cricket, coming after 12 years and 22 losses. Rafique was adjudged Man of the Match for his all-round feat. Bangladesh however did not win any other game in the tournament, and failed to qualify for the final. Bangladesh’s next two ODI wins came in the 1999 World Cup in the U.K, where they beat Scotland by 22 runs and stunned Pakistan by 62 runs. The latter result paved the way for their Test status in 2000, which was undoubtedly a premature decision. Even after becoming a Test nation, Bangladesh’s ODI performances were largely mediocre. It took them their 100th ODI to post their fifth win – a 15-run win over India at Dhaka in 2004-05, also their first win at home. Hopefully their showing in 2012 is a good sign for the things to come, as the cricket world needs a strong Bangladeshi team in all formats. That the word ‘upset’ is no longer attached to a Bangladesh ODI win speaks for the progress that the Tigers have made in the 50-overs format in recent times.